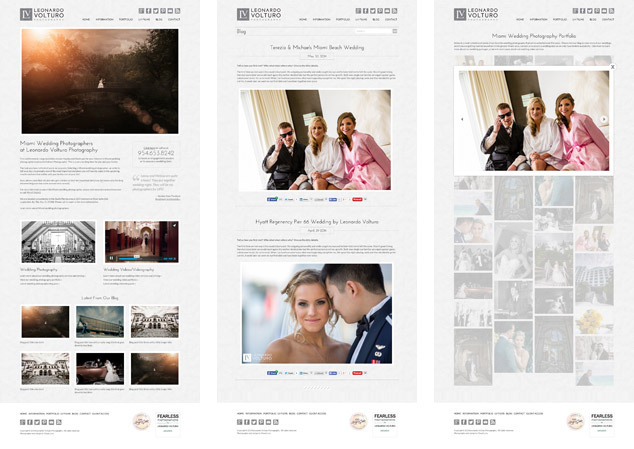 The new website we built for Leonardo Volturo Photography has officially launched. Leonardo Volturo Photography is a high-end Miami based engagement and wedding photography and videography studio that serves all of Southern Florida. The new site was built in WordPress and features a fully custom theme built from scratch, masonry style portfolios, and an infinite scrolling blog with hard coded custom social media share buttons. Visual Lure will also be providing ongoing search engine optimization (SEO) services. Check out the new website at www.leonardovolturo.com. Learn more about our photography WordPress web design services, check out our website design portfolio and learn more about our search engine optimization (SEO) services.